It’s always interesting to me to watch what fads come in and out of the food scene. Cronuts™ to cupcakes to kale everything. 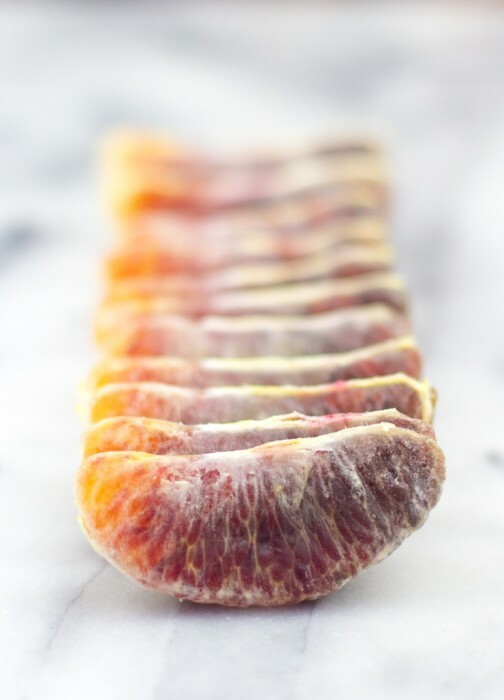 Blood oranges are now one of the most flashed around photos on the scene. Citrus always makes a strong appearance during the winter months, but this juicy jewel has taken the seat at the head of the table. Give in to peer pressure, right? Right. 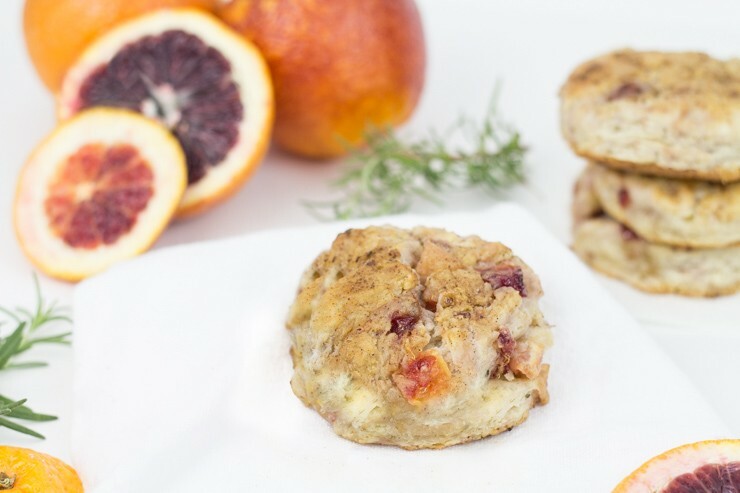 — Blood Orange Biscuits are our contribution to the buzz. Turns out, they aren’t just pretty to look at. These Southern staples got a new addition, and are just delectable. Could they be any prettier?! That deep raspberry-like color is a ideal indication of the flavor that is given. 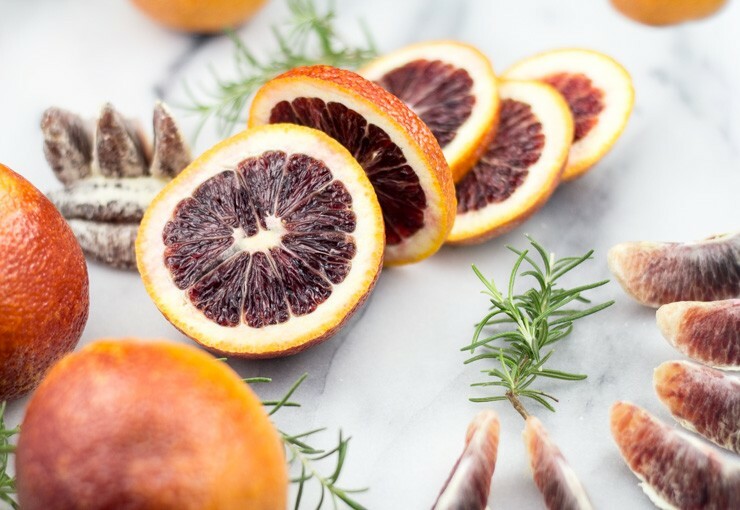 Blood oranges do actually taste different than a regular run-of-the-mill orange that you may be more commonly acquainted with. They have a deeper, less acidic profile, and even an ever so slight bitterness. Not an unpleasant bitterness (because if you are anything like myself, I associate that word with everything that tastes awful), but just enough to balance the sweetness and lessened tartness from a comparable traditional orange. Imma get a little Scientist on you now… This gorgeous red color, obviously the namesake of the vampire-friendly fruits, comes from a class of pigments in plants called anthocyanins. This pigment doesn’t really carry must of any taste with its addition, but does contribute slightly to the bitter-tartness of the fruit. This is the same pigment that lends to the beautifully vibrant purple color in pansies (the flowers; not the annoying coworker beside you). This batch of blood oranges came from my Green BEAN Delivery package this week. Check out our Ginger Beer Cupcakes with Roasted Pear Mascarpone Frosting post to read a bit more about that service (and get a discount on your first box!). Even just as a simple squeezed juice, this fruit will give you a unique, new flavor to introduce. It doesn’t hurt that they are pretty enough to just have around for the table, either. Since these are now as popular as an argument on baby vaccinations, you can even find the extract to use in baking or candy-making. 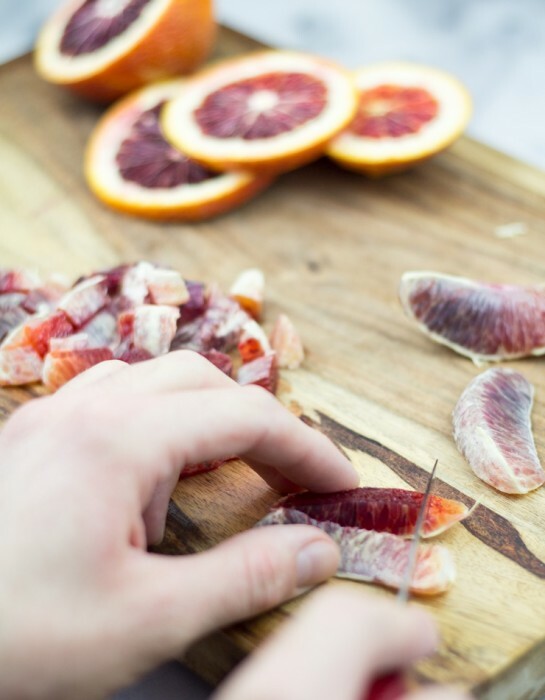 Blood orange candy using our Lemon Drops recipe would be damn good! The trick with this recipe is going to be with handling the moisture from the addition of fresh fruit. Adding moisture into any dough will almost always make it difficult to keep the flakiness in a constant battle during the bake. I sliced and diced these oranges and then placed them on some paper towels to rest. If you man-handle these pieces into the dough, you will almost certainly end up with flat, but still delicious, blobs of dense biscuits. More scone-like, maybe. BUT… you are going to be gentle, right? The best biscuits are made with a light handed mix. Leave the mixer, like the baby, in the corner for this recipe. Look into the dough, and you will notice that the orange pieces are still in small sections. The butter is still visible in small beads. 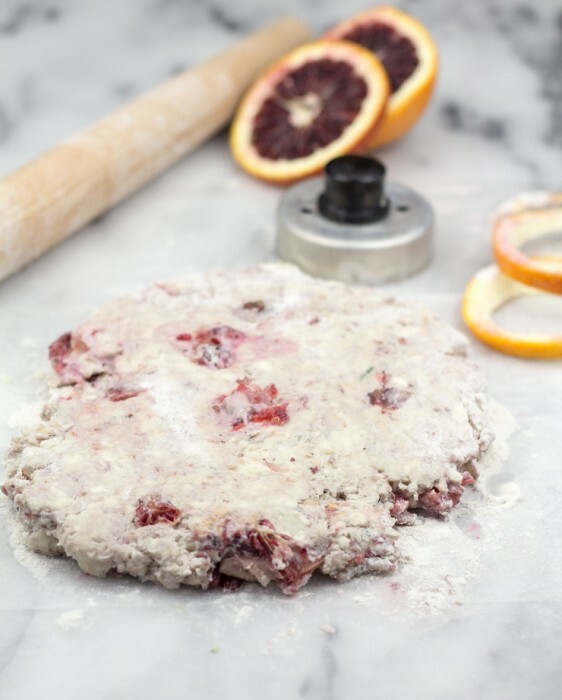 The dough itself hasn’t really turned into a blood-colored blog. All of these things are good. That means it wasn’t mixed so much that the tiny little juicy capsules of the fruit exploded into a biscuit-ruining disaster, and the butter will melt while cooking, leaving you with flaky, warm bites. The sweet and sour punch of the fruit goes great on its own, or with your typical biscuit fillers. 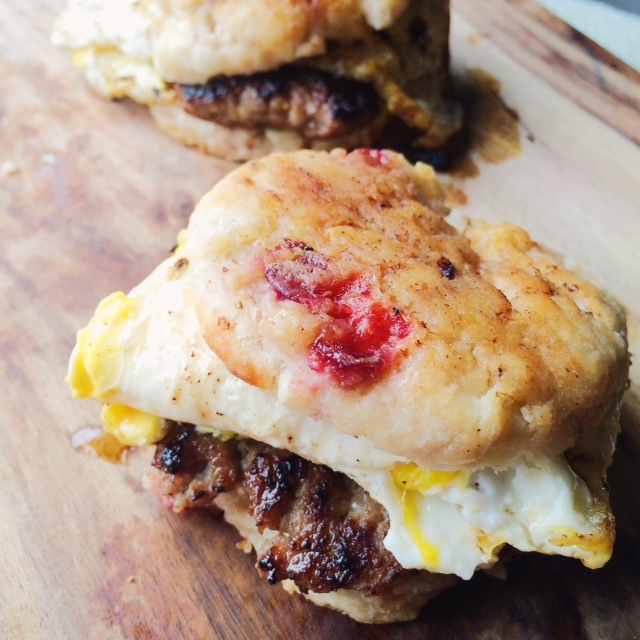 I ended up trying these the next morning as a twist on a sausage egg biscuit. It. Was. DELICIOUS. Follow SouthernFATTY on Instagram for more photos like this! Biscuit love at its finest, y’all. The unique addition of the citrus will give you small surprises in every single bite. 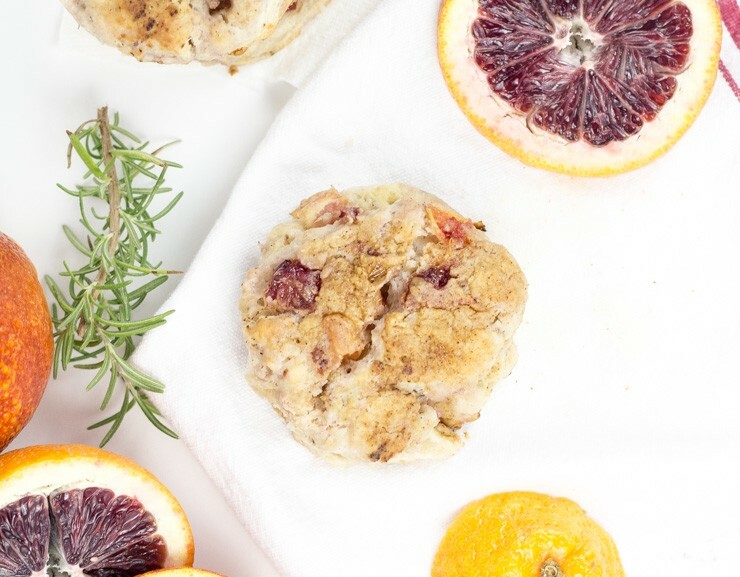 Chop blood oranges and place on paper towels to rest. In food processor (or with hands), combine flour, baking soda, baking powder, salt, cinnamon, rosemary and mix well. Pour flour into large mixing bowl. Carefully fold in blood orange pieces. Take great caution to being light with this. The more you break the fruit, the less the biscuits will rise while baking. Pat out into an approx. ½" dough. Cut out biscuits. Place in buttered skillet or pan. Remove to cool and enjoy! Top with melted butter/cinnamon glaze just before enjoying. Say hello on Instagram for sneak peeks & tasty treats. Oh… and some cats photos, too. What an unexpected thing to do with blood oranges, Phillip! That picture of it as a sausage biscuit looks uh-may-zing. I hate how I wrote that but it feels appropriate. You’re totally right though, I feel like they deserve their own damn Feed Feed page. Blood Oranges everywhere these last few months! my mom is getting these for Mothers Day… Will blood oranges be out of season by then? Probably so. 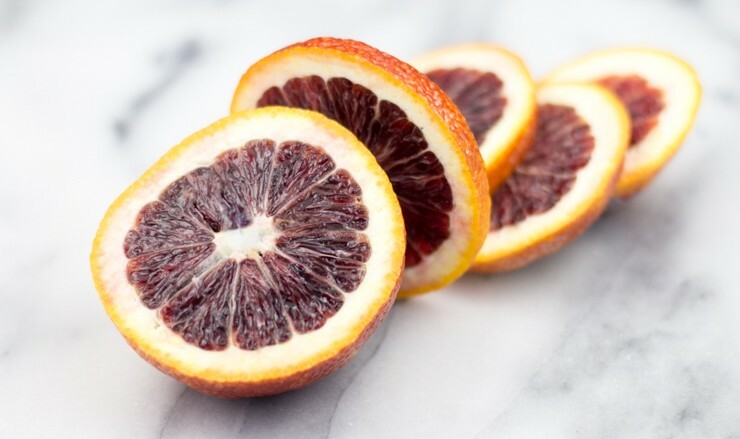 There are two main varieties of blood orange. One peaks from Dec to March, and the other (Tarocco variety) from Jan to May. I would check at Whole Foods around then. Hope y’all enjoy them! I couldn’t find that anyone had made biscuits with them. Ended up being a pretty good experiment!